By HydroTech Corporation based in Anderson, INDIANA (USA). By Peak Environment, LLC based in Troy, MICHIGAN (USA). ESG's radiochemical laboratories at Harwell have extensive experience in the determination and testing of low level radioactivity in environmental samples, drinking water and food. We also routinely analyse higher levels of radioactivity associated with contaminated land, decommissioning work and nuclear fingerprinting. By ACZ Laboratories, Inc. based in Steamboat Springs, COLORADO (USA). By AQUI-VER, INC. based in Park City, UTAH (USA). Radon is a naturally occurring radioactive gas that is colorless, odorless, and tasteless. It is formed by the natural breakdown of uranium in rock, soil and water. Radon gas moves up through the soil and can be drawn into our homes by slight pressure differences. Once inside, radon can become trapped and build up to unsafe levels. SkyTEM measures variations in the physical parameters of the earth. These parameters are conductivity (or resistivity), magnetic susceptibility and radioactive element concentrations. Changes in the top 600 m of the earth’s subsurface that produce measurable variations in these parameters present potential applications for SkyTEM technology. By Enviro Management Inc. based in Toronto, ONTARIO (CANADA). 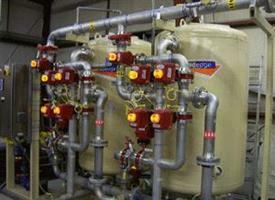 By Water Remediation Technology based in Arvada, COLORADO (USA). By Envirogen Technologies Inc. based in Kingwood, TEXAS (USA). By WISUTEC, Wismut Umwelttechnik GmbH based in Chemnitz, GERMANY. By OAK CREEK, Inc. based in Buxton, MAINE (USA).